878 is at B depot. The buses at woden will either be gradually parted out (as per 991, 2 and 5) or stored in as is conditio for sale at a later date....my money would be on parts. Unsure if this has been noted, but 878 at Woden. Probably since 128 went to Belco (because it is where 128 was next to 127). And 899 has been withdrawn. It is at Woden Depot and has been since yesterday at least. Turns out neither were withdrawn. But 892 & 895 have been. I spotted a PRO MkII at Access Recycling yesterday. I was in the good work van, so I couldn't drive it in for a closer look. 857 was towed from Woden to Belco yesterday, while 102 was recently towed from Belco to Woden. Seems strange, at least to me (cause of the numbering removal sequence), that 916-919 have been decommissioned, yet 894 and 898 are still kicking. Is that a brakedown + parts issue? It's not strange when you consider which depot they are withdrawing PR100.2s from. It should also be noted that withdrawals are not always done in fleet number order. For example, the second reasonably sized batch of Mk1 Renault withdrawals back in 2004 took in buses between 697 and 834. Seems strange now that the first of the Mk1 Renaults were withdrawn in April 2000 (677/678) and it wasn't until July 2015 that the last one (853) was withdrawn. I meant it seemed somewhat strange to me. I know there's no reason that ACTION has to remove them in a numerical order, cause there's already been the 913-915 gap thats been there for the past 10 years or whatever. Anyway, I checked out the wiki the other day to see all the recent removals - so I could somewhat update my book and list all my last trips on each decom-ed bus, and I was surprised by some of them, including 118 and the 916-919 bunch. Sad to see them go, but everything has its time. They didn't really have a choice when it came to 914. Like 797 before it, there was no way it was going to be repaired and returned to service. Oh well of course, that crash was unfix-able. I just had a peek at the fleet list again, although it says 882 is a Tuggeranong Trainer bus, there's no chance that I'd ride it next year right? In a sense, it's removed from service, but not as yet decommissioned? Trainers have ended up back in service before, but 882 is probably unlikely to do so given most 800 series have been withdrawn. Trainers have ended up back in service before. 878 was one such example. For the first time in ages, the is a gap of a few buses at Woden Depot. LWF (who is far too important to lower himself to posting in a forum) has reported that 993 was towed from Belconnen Depot this morning, possibly destined for Access Recycling. WOOHOO! Lets hope 992 went with it. Bus 992 is sitting safe at Woden Depot, ready to reappear. For quite some time, as each new delivery came into service, a Renault was immediately retired. But, there have now been 7 new buses put into service with only 921 transferred to training duties. I wonder if this break in the pattern has any significance? Which reminds me - do we know if we're likely to see PR2s or PR3s go? We don't know. My guess is that there may be some of each to be withdrawn. Since there won't be any more withdrawals for a while, they might select troublesome buses rather than stick to strict date order. But by 31 December, there will need to be 10 Renaults withdrawn to achieve 80% low floor. Update: the 3 remaining flip dot PR100.2s have been moved to Woden Depot, along with 922. 120 which has been marked withdrawal to be confirmed on fleetwiki is just came through Fadden running a 67S. 122 - 124 have also been seen today, 125 boarded yesterday, and 119 last sighted 17/8. Yes, 120 still in service and will be restored at the next available opportunity. 121 was sighted yesterday by King of Buses, so it's still active (for now). 936 may have been involved in an accident this morning on 67 on Coyne Street - tripmate showed it stationary there until after 8 am, while the following bus due there at 7:55am detoured around Coyne street. 936 was displayed to have eventually resumed its run 30 minutes late. The ACT ESA site showed an accident there at 7:29:37, which is within a minute of when the bus is scheduled through there. 936 in service today. So whatever happened, it wasn't serious enough to be withdrawn. What are the chances that they have delayed withdrawals as they require an increased fleet size for the upcoming network, with potentially some of the PR2s to be transferred to Belco? I'm not sure Belconnen have much room to spare for any extra buses. They had enough trouble fitting 621 in, I'm told. Though I'd say it is likely the new network is why there haven't been as many withdrawals as there have been deliveries - whether it is a permanent increase is not certain though. Might have something to do with 710 and 712 too. Can't rule out a slight increase in fleet size, but they have to reach 80% low floor by 31 December 2017. Right now with 2 new low floor buses in service it is at 79%. Even counting the Darts they are under 80%. While 935 remains using a flip-dot it becomes the most likely next withdrawal candidate - especially with a Network change not far off. But definitely expect some withdrawals by 31 Dec. I noticed 3 more P2s have been withdrawn. Could it be possible to have an exact date of the withdraw on them please, it would really help out. I didn't mention it because I'd forgotten 936 was supposedly withdrawn (has been marked as so on fleetwiki since 8 Sep), but I have it down on my sightings list for Friday (15th). And definitely not an error because I remember its flaky rear number which took me a moment to work out whether it said 936 or 938. It was laying over in Woden, I think in the afternoon. So it seems to have been reinstated at least temporarily. Also, could we have withdrawals back to being displayed on the recent changes list on fleetwiki? Can confirm 936 still in service as of 20th Sept 2017 as I rode on it on a route 1 service yesterday afternoon. 121 is also still out and about. Rode on it on route 319 service the day before (19th). 936 was definitely removed to Woden Depot but has since returned to service. The new question is - has 935 been seen since 936 was reinstated? 935 photographed by myself in service this morning (21 September). A 99# series PR3 (fairly sure 996, but the removed fleet numbers weren't so clear) without a bike rack and missing its rear bumper was being towed by the ACTION tow truck Northbound on Erindale Dr (cnr Ashley Dr) at 9:05am (and continued up Yamba at least to Farrer) this morning. Getting scrapped? 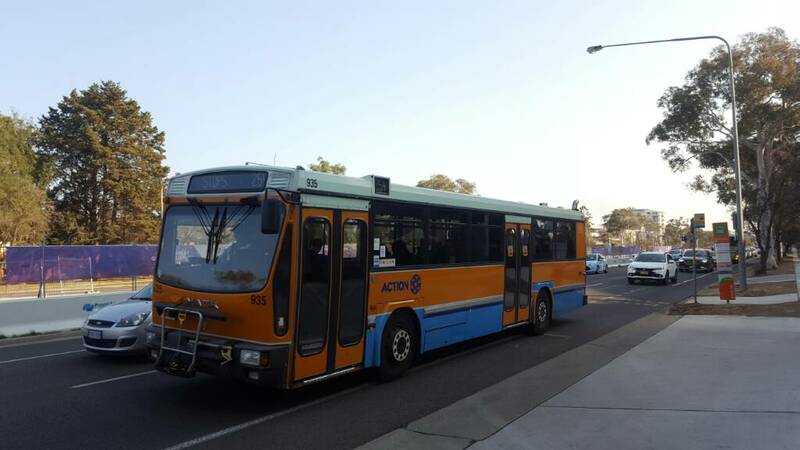 King of Buses has reported that Bus 997 is now the parts PR100.3 bus at Tuggeranong Depot. So that confirms that it was 996 which was removed, presumably for scrapping. Are any withdrawals or transfers expected with 711 and 652 onwards entering service? From what I've been told, no more Renault's will be removed from service till at least 2020 - something to do with the Woden Depot upgrade. You'd think that 652+ (depending on the frequency & running time) would cover the 53/953 until the new network starts. From what I've been told, no more Renaults will be removed from service till at least 2020 - something to do with the Woden Depot upgrade. Yes. That was (probably) the plan when they were ordered. But since Network 18 consultation has yet to commence, the only need for extra buses in the short term are for route 53. So I wouldn't be surprised if once a few Volgrens enter service we see Renaults sent to "storage" until they're needed again. For sure, esp with the lack of any work being done to the depot atm. The two current depots do have a limit in how many buses they can hold, so I was thinking the same. Despite what was mentioned above, Bus 104 is believed to have been withdrawn due to a mechanical failure. Although there is also the possibility it will be repaired at a later time. We may know for certain once the annual bus registration renewal occurs. The annual bus registration renewal exercise has occurred. No spoilers, but it does appear as though seven buses which are currently in service won't be by the end of next week. Watch this space and/or the cage at Fyshwick for further updates. 104 has not been renewed, nor has 915 which hasn't been seen in service for some time. The fleet wiki now shows 7 PR100.3 taken out of service. What is it about the PR100.3 that has resulted in recent years in a large part of the PR100.3 fleet being removed from service before all the older previous model PR100.2 are retired? It's mostly due to the lack of part replacements. If something goes wrong, they can't always fix it, and I guess the 3's are a little more dodgy than the 2's. The fleet wiki now shows 7 PR100.3 taken out of service. Eight if you include 104 which was withdrawn in June for (allegedly) mechanical reasons. As was stated above, they may not be permanently withdrawing buses at this moment, just putting them aside for re-use later. Of the PR100.3s, 16 now remain in the fleet; with a further 22 buses still to enter service will these remaining buses also be temporarily withdrawn?